Flexibility is an important aspect of your overall health and fitness. Flexibility training should go hand in hand with your strength and aerobic training. 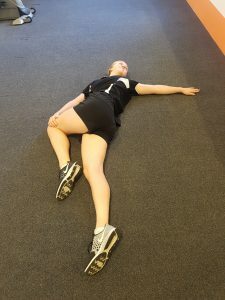 Stretching causes the muscle fibers and surrounding connective tissue to lengthen. The stretch reflex attempts to resist the change in muscle length by causing the stretched muscle to contract. However, regular stretching decreases the stretch reflex and allows for greater lengthening of the muscles. Increases ability to move joints through their full range of motion. Improves performance of everyday activities and sport specific movements. Increases blood flow to muscles, which also helps to reduce muscle soreness. Stress relief-muscles often tense up when you are stressed. Stretching tense areas can help relieve stress. Reduces risk of muscle strain– lengthening the muscle prior to exercise makes it less prone to tearing. Static stretching means a stretch is held in a challenging position for a period of time. 30 seconds is an effective amount of time to hold a stretch in order to increase range of motion. Dynamic stretching involves actively taking your muscles through its full range of motion. It is important to stretch before and after exercise. Dynamic stretching before exercise helps to increase body temperature and prepare the body for specific movements. 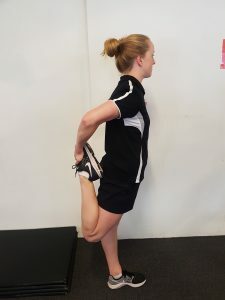 Static stretching of fatigued muscles performed immediately following exercise, helps to increase flexibility and decrease the level of post-exercise soreness. This is because muscles tend to shorten after repetitive muscle activity and if the muscles are not stretched afterwards, they retain this decreased range of motion and stay tighter and sorer for longer. There isn’t a limit on how often you should stretch. Essentially, the more often you stretch, the more likely you are to increase and maintain flexibility. 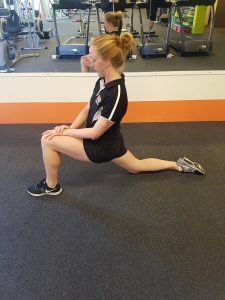 If you would like to add flexibility training to your program, Exercise Physiologist Courtney Maher runs a stretch class every Wednesdays 8am-9am. This class caters for all levels.